Michael Rosman, Mark Lohr and I just finished our final 2008 circus camp yesterday afternoon at Camp Milldale in Reisterstown, MD. 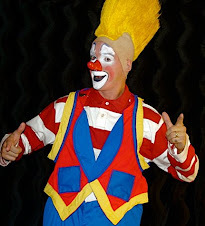 We taught 30 children juggling, balance, plate spinning, diablo, devil sticks, tightwire, rola-bola, stilts, rolling globe, chari-vari and clowning. It always a pleasure to teach with Mike and Mark and we have a great support staff in Noelle Burk, the "V Family" and Michael's wife Heddie. This year we had a tremendous number of students returning for a second, third and in some cases a fourth year! 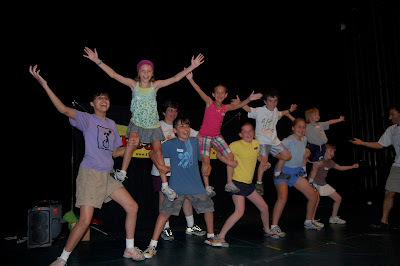 With the countless number of options as to how to spend your summertime available to kids today we are all deeply appreciative that so many of the same kids choose to keep coming back year after year, session after session to hone the skills that they've already acquired and are eager to learn more. Another nice feature is that it's a family affair: Michael brings his two children, Mark brings his seven or eight of his fourteen kids with him and Shane even spent a few days this summer, becoming new best friends with Michael's son Ethan. That's particularly nice because Ethan's dad Michael was staying at our house five and a half years ago the day that Shane was born. On the long ride home yesterday Shane watched the second volume of the brand new clownalley.net DVD compilation and got to see Lou Jacobs perform the Hunting Gag for the first time... and absolutely loved it... and watched it over and over and over again. 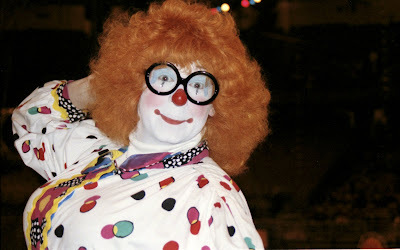 An unidentified clown who looks to me to be a young Mark Anthony. What say the experts out there? The Joshua Katcher directed video for Rachel Sage's song "Vertigo" from her new album Chandelier. As for the chump in Slivers Oakley's makeup, "Who hired her"? 2. Ceslee performing the sunblock umbrella walkaround at the PR. like the one from the painter soap gag DeSanto did on Blue in the 80's. 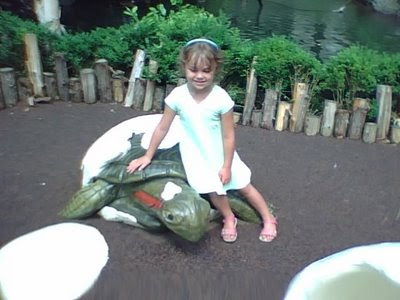 Congratulations go out today to my friend, Kelly-Miller "show kid" Georgia Grace Cainan (daughter of Casey McCoy and Natalie Cainan and the grand-daughter of ringmaster and magician Phil Chandler) who graduated kindergarten yesterday! Let's give the little lady a hand! Perhaps Raffaele de Ritis could coax my friend Frank Bogino into giving us all some more information on the Sorelettis. 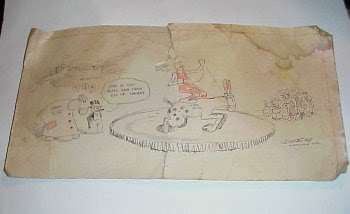 My name is Frank Bogino - my family whent to the US on the Ringling show in 1947 and I was born in Boston that year. We were one of the best risley acts in the country and the first acrobatic circus act to be engaged in a Las Vegas Revue - The Dunes in 1950. 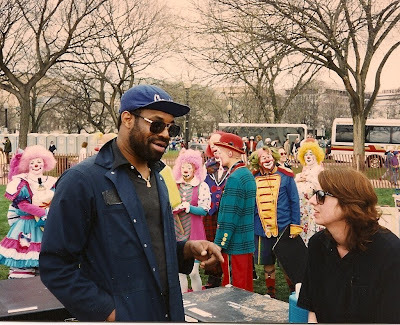 I grew up in New Orleans and also went to music school. 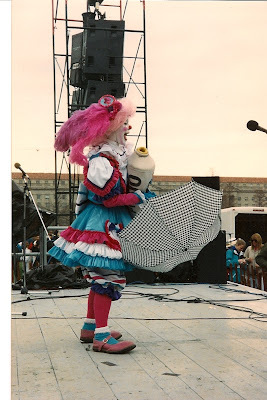 In the summer I was learning to be a circus artist and became a very good acrobatic tumbler and risley top man but when I started traveling with the family I was called in to the US Army. 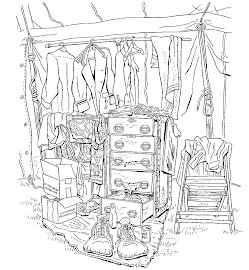 When the Vietnam war was over I went to Europe with my family and worked in the top circuses. In my 30s I set up a very nice comedy act similar to George Carl and with this act I performed in the top theatres and circuses in Europe. At the age of 43 I retired and today I manufacture Amusement Rides. Video tributes to Lou Jacobs a well as a slideshow of photos taken directly from Otto Griebling's personal scrapbook, the Barry Lubin roast (no Euro-trash balloon "artistes" allowed) and the awarding of the Lou Jacobs Lifetime Achievement Award to Mike Coco... all at the Clown College 40th Anniversary Reunion at the Circus World Museum in Baraboo, WI September 18-21. If you haven't already, please click the link to your right for more information. 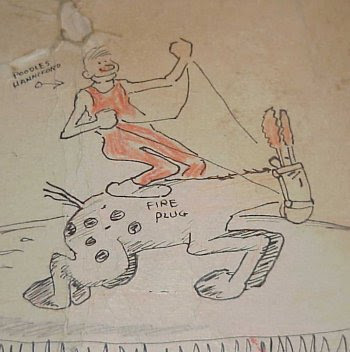 A sketch of Poodles Hanneford by Billy De Beck, the creator of Barney Google and Snuffy Smith comic strips. 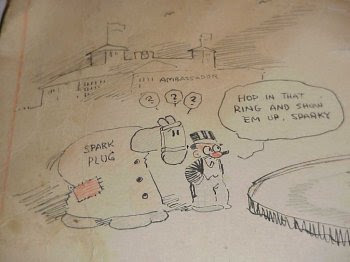 Outside the ring notice Barney Google and his horse Spark Plug, the inspiration for Jack Le Clair's famous bendover gag. 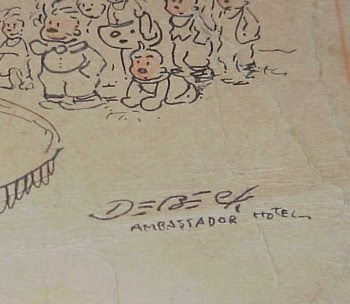 Under De Beck's signature it says that the sketch was done at the Ambassador Hotel which means that it was probably done in Los Angeles during Poodles stint in silent comedy shorts. 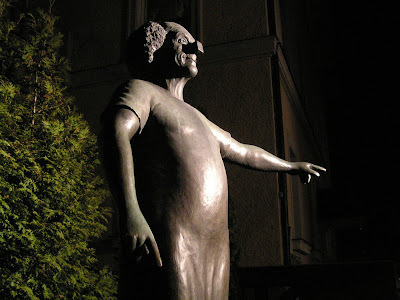 The statue of Charlie Rivel that stands outside Circus Krone, one of several staues erected to Rivel around Europe. I'm sure that there will be Lou Jacobs and Otto Griebling statues erected outside the new Madison Square Garden, right? I hear that they are almost finished with the Barry Lubin statue in Damrosch Park. 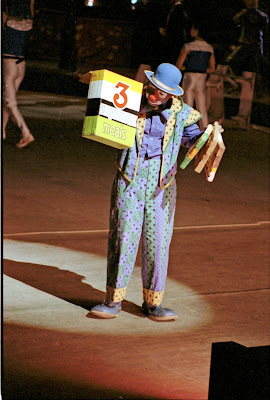 A CBS television commercial for the Clown College 20th Anniversary special. 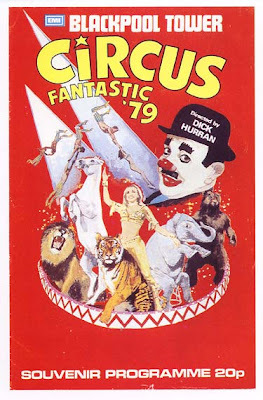 The 40th anniversary will be held in less than a month in Baraboo, WI at the Circus World Museum. CBS won't be there, but it's going to be pretty special nonetheless. Click the link to the right to see the latest, updated schedule of events and if Greg and Karen don't already have your checks... GET THEM OUT NOW! Time's a wastin'! Little Billy on the cover of the 1960 Bertram Mills program. 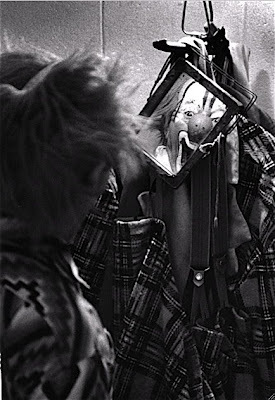 I drove myself crazy yesterday afternoon trying to find out the name of a clown in a piece of video. Dominique Jando, Greg DeSanto and Raffaele de Ritis were kind enough to confirm the performer in question as Fredi Codrelli. 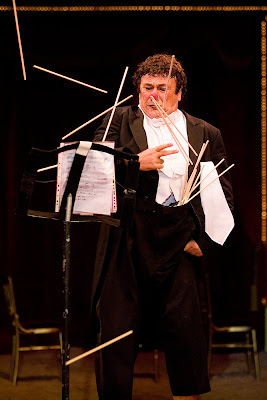 The clown doing the scarf magic with Zippo-Paul is Fredi Codrelli. 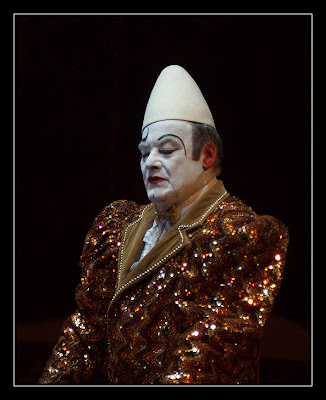 He was an Austrian clown, that Bernhard Paul booked in the early Roncalli tours (1980-84). They did togheter several entrée (talking a lot). Codrelli is largely responsable as teacher and developer of Zippo's character. 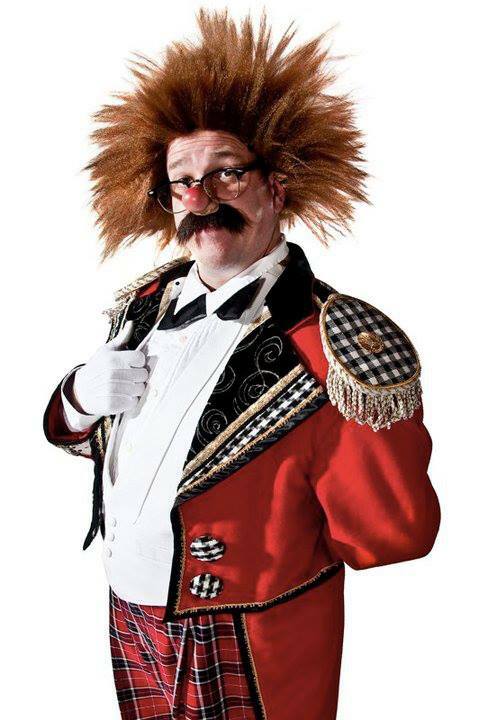 "LITTLE BILLY" MERCHANT, who has died aged 81, was a much admired midget circus entertainer. William Merchant was born on July 31 1919 and, having been abandoned by his parents at an early age, grew up in an orphanage in Bristol. As a youngster he was fascinated by the local variety theatre, which he would visit at every opportunity, and in 1937 a chance encounter at the Bristol Empire with John Lester's celebrated troupe of midgets brought him his first job. 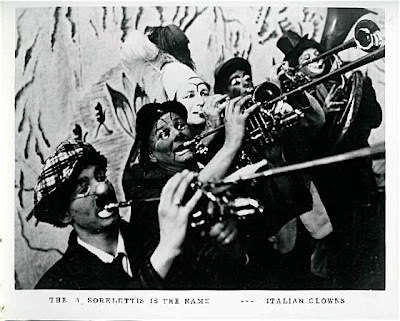 After working in Lester's act, he joined Joe Boganny's band of acrobatic dwarves, another renowned music hall act of the era. During his time with Boganny, Merchant appeared at all the leading variety venues with such well-known stars of the day as "Wee" Georgie Wood and Elsie and Doris Waters. When war came, he worked as an aircraft fitter for the Bristol Aeroplane Company. 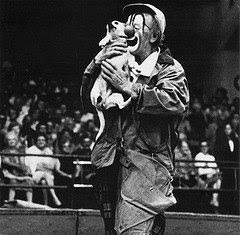 He then spent the summer of 1944 at Chessington Zoo Circus in Surrey, playing alongside the clown Fiery Jack (Fred Zetina). 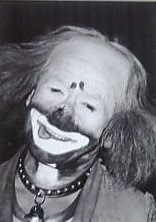 Merchant next teamed up with the Austin brothers, Len and Alby, and in 1945 they were featured at Blackpool with other clowns such as Coco. Merchant returned to Blackpool two years later with Charlie Cairoli, whose simple style of make-up he afterwards imitated. 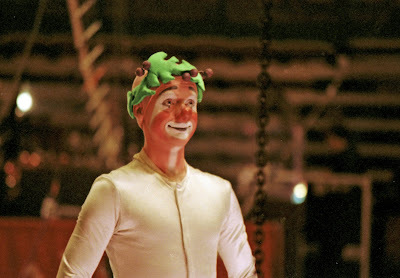 He and the Austins next worked with Chipperfield's Circus for two years before parting company. 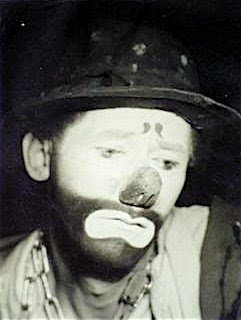 Merchant then appeared as a reprise clown with Bertram Mills, playing Olympia in London each winter until 1964, and touring with the show's travelling circus until it closed the same year. 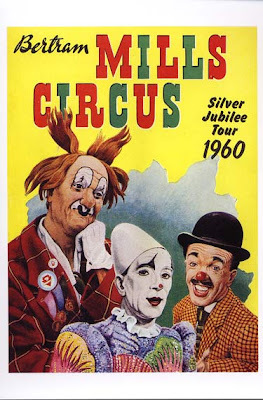 He was often teamed with the Mills circus's other principal midget clown of the post-war years, Nikki, and the two were regularly billed as "Britain's funniest 'little fellows' ", as dwarves were known in circus parlance. 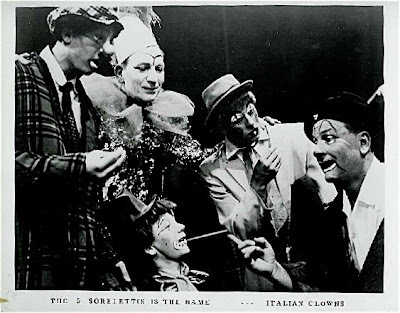 On one occasion they appeared with the ringmaster Frank Foster in a skit in which Foster, dressed in drag, played Brunhilde, while Nikki wore Robin Hood garb and Little Billy was a diminutive Norseman. 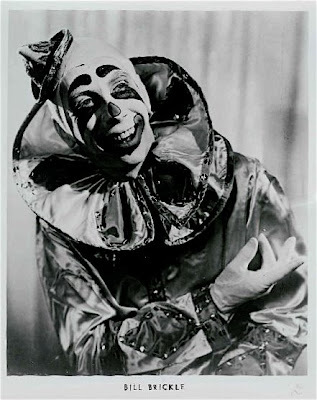 Although Merchant was offered a place with the Moscow State Circus, in 1965 he retired from show business and went to live with friends in Reading. This interlude did not last long, however, as his former colleague at Mills, Jacko Fossett, found himself in need of another partner. 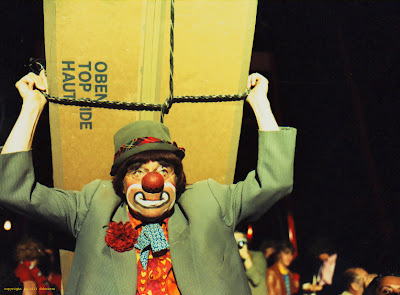 Fossett had joined Cirkus Schumann in Copenhagen after Mills had folded, and when Schumann's long-serving dwarf clown Kiki retired in 1968, Merchant was persuaded to team up with Fossett and Antonio (Schumann's other in-house midget clown). 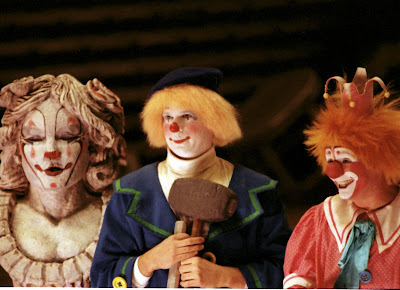 After Schumann's was also forced to close, the trio went to Cirkus Benneweis in Denmark. In the years that followed, Little Billy and Jacko Fossett enjoyed great success together on the continent with Cirkus Krone in Munich and at the Stadthalle in Vienna, as well as in Puerto Rico. 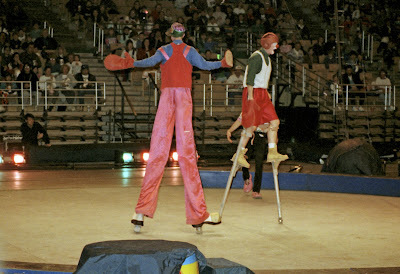 They regularly returned to Britain for television shows featuring Chipperfield's and Billy Smart's circuses, and often played winter seasons at the Belle Vue Circus, Manchester. They also spent six summers working at the Great Yarmouth Hippodrome. 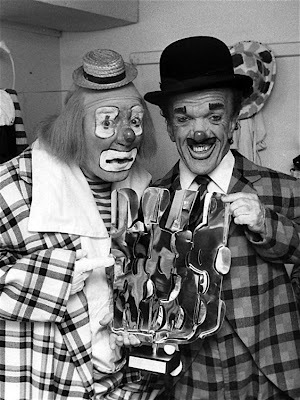 In 1978, Merchant and Fossett won an award at the annual Clown Festival held at Blankenberge, Belgium. Merchant retired again to Reading after the end of that year's winter season at Belle Vue. In the 1980s, he moved to Skegness, where he and Fossett eventually lived in the same nursing home. On occasions they also found themselves in neighbouring beds when ill health necessitated hospital treatment for both, though in all their years together they never exchanged a cross word. Fossett called him "the best partner I have ever had, and the one with whom I never had an argument." 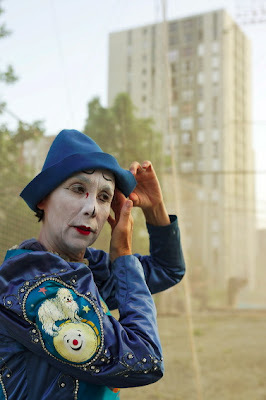 Merchant was the recipient of a lifetime achievement award from the Circus Friends' Association of Great Britain last year. Ms. Valérie Fratellini (Annie's daughter) in the spring of 2008, photographed by Cristoph Raynaud De Lage.